Anime Otaku Reviewers: Pierrot's Blade & Soul Experience Pt.3 : I'm Back! Pierrot's Blade & Soul Experience Pt.3 : I'm Back! 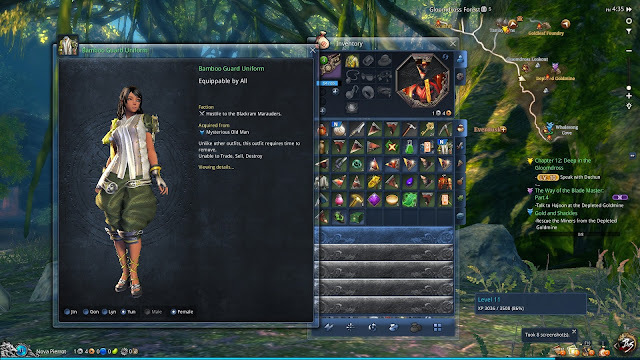 My Blade & Soul adventures are back! I've been a bit busy with life, so finding time and motivation to play again or post was difficult. That's not what today's post is about, though! I've got good news. Really good news...I beat that strong guy who was difficult for me in Chapter 8: Pirates and Thieves and moved on all the way to chapter 13! There's also a new startup logo which looks pretty cool. I had some difficulty with the quest called The Source of the Bloody Jiangshi. I was wondering what was in the Defiled Tomb, so I was all for it. 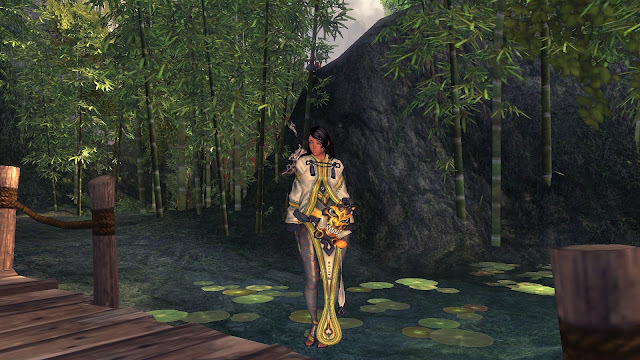 Plus, the reward was a new outfit so I couldn't refuse. It seemed easy and I figured being at level 9 was fine since I was successful with passing Chapter 9 twice. I learned after that Nekuro was NOT easy to kill, but he will kill me easily. I thought maybe I needed to be at 100% health before attacking, so I tried that...he still killed me. I had stopped playing at that time because it was late, but that last time lasted weeks instead of days. Fast-forward to last night, I decided to start Chapter 10: Anchor's Away! instead of picking up where I left off. I headed into the Blackram South Anchor hoping to continue the story, but it didn't work that way. I ended up being killed by four enemies at one time..I escaped and restored my health, but when I tried again, they killed me. I ended up going back to Everdusk and decided to go hunt bears or any enemy I came across to level up. Eventually, I made it to 10 and realized I still had to beat Nekuro. I figured it would help make me stronger, so I headed back to the Defiled Tomb. This time, I was able to get him! He dropped a lot of good stuff, so I think it was worth it. I headed back to the Foshi Pyres to let the guy who gave me the quest know and got my new outfit. I was going to go with the red and black version of the outfit, but this one looked better. I was going to stop there, but I was having fun. Since it was my day off, I decided to keep playing and went into Chapter 11: Gone Fishing. It was located in Whalesong Cove which looks terrible. It's all gloomy and there's some dead people of to the side. One guy was still alive, so he tells you what happened to the village. Basically, some evil energy attacked the villagers and turned some into zombie-like beings. I made my way down to attack the 'corrupted villagers' only to find out they still somewhat looked like the normal ones. I ran up to three of them and ended up being chased until some Bamboo Guards killed them for me. 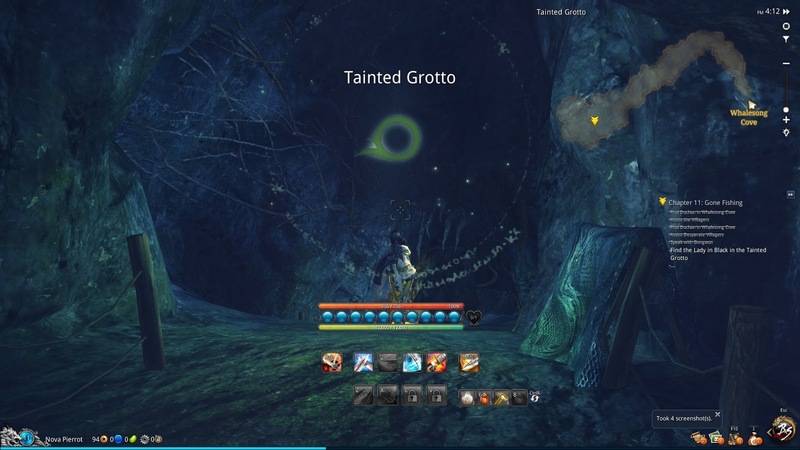 I almost died, but got to the point in the chapter where I was supposed to go into the Tainted Grotto to find the Lady in Black who happens to be the person that killed Master Hong. I was pretty cautious when I went in because I already knew she could kill me, but thankfully that didn't happen. 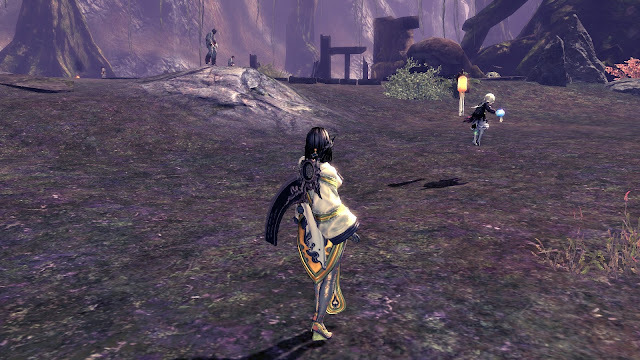 She ended up running away when Dochun came in and we made our escape with a flamethrower. Honestly, that was a little weird, but I didn't question it since it was keeping me alive. When we made it out, Dochun headed to the Gloomdross Forest. That was where the next chapter was going to take place at, so I knew I had to head there eventually. I also got a letter from Brother Hajoon saying he was there, so I already knew I would be going in no matter what. But first, I did some quests of that area in case I needed to do things for them in the forest. 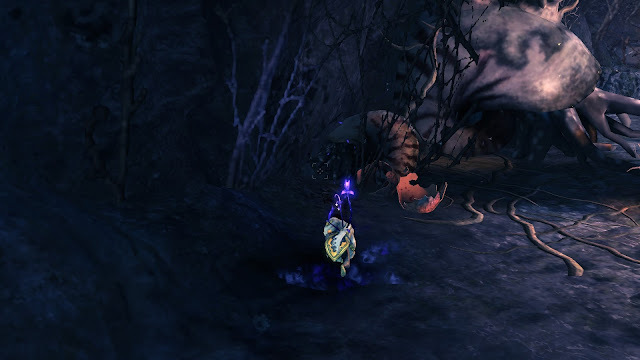 When I got into Gloomdross, I noticed some mushroom creature that reminded me of the ones from Maple Story. They didn't attack me, so I left them alone. A little way's into the forest, I came across a man called Chung Unnam. 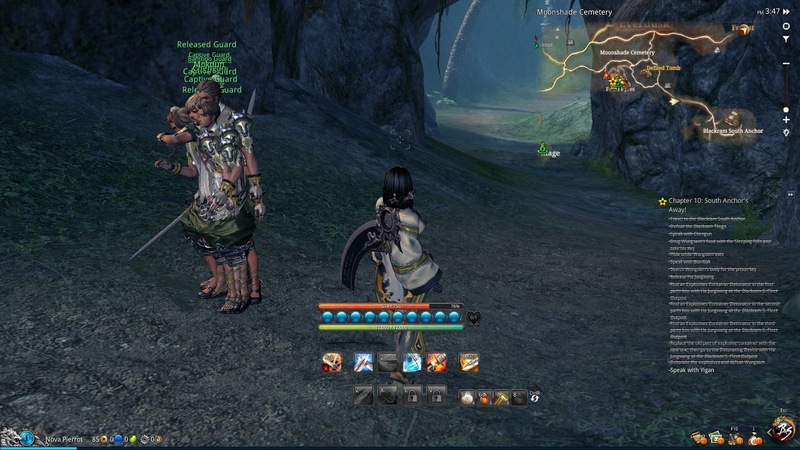 I didn't really get why he was there, so I left and went to the group of Bamboo Guards across from him. One of the people there had a letter for him, so I went over and delivered it. It turns out he's a tailor and makes uniforms for the Bamboo Guard. I ended up getting a uniform from him for free and without much effort. I continued on to the Tanjay Kilns where Dochun was. I met another person who wanted me to check out corpse in a place called the Dreamdrift and tell Paso of the Char Coalition. I went out of the meeting house and saw there were some quests so I went to see what I could do. since some were in the areas I needed to go to. There was one in the Dreamdrift, so I headed in that direction first. I passed by some cute sprites that weren't really mean unless you attacked them first. I don't recommend doing that, by the way. They are very difficult to kill. I went into the Dreamdrift and met someone who told me everything in there is made of wood, including the creatures. He then gave me a torch and I was able to light the monsters on fire. I had to do that 15 times before I was able to leave. I also found the corpse only to be attacked by some freaky-looking...thing. It was also flammable, so I torched it. It dropped a badge, so I took that back to Paso who told me it was his brother's. I felt bad, but we changed the subject. I asked about the lady in black whose name is Jinsoyun and he said she was in the North. 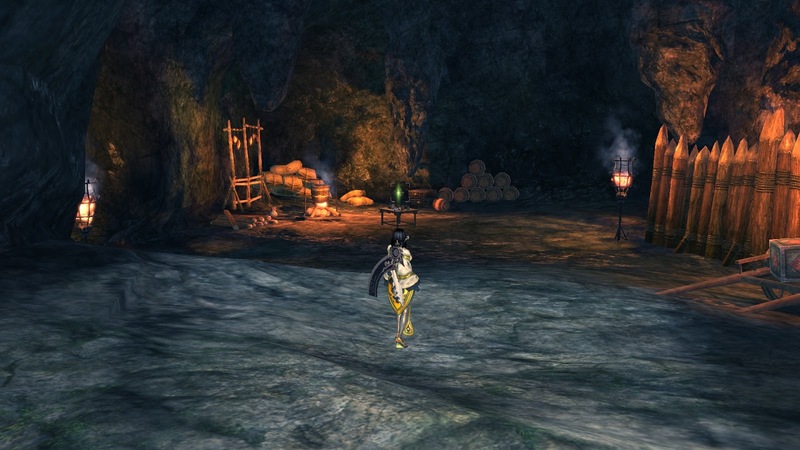 I went to tell Wonhong, but the guy who made the bombs back in South Harbor and ditched me was with him. He was wanting some kind of powder to make mega bombs, but no one would give him any. You don't even have to play to know where this is going. He told me to get him some. Unfortunately, I can't refuse if I want to progress the story, so I told him I'd do it...surprisingly, the Char Coalition people were willing to do it. I really wanted them to say no, but they're nice people. That was the end of Chapter 12, and I was surprised to see that I had made it to level 13! I'm really happy with the progress I've made so far, even though I think I'm still in the beginning of the game. Part four will be coming next week!